Eicosapentaenoic acid (EPA or also icosapentaenoic acid) is an omega-3 fatty acid. It is obtained in the human diet by eating oily fish or fish oil—cod liver, herring, mackerel, salmon, menhaden and sardine. It is also found in human breast milk. Fatty acids are a carboxylic acid with a long unbranched aliphatic tail (chain), which is either saturated or unsaturated. Fatty acids derived from natural fats and oils may be assumed to have at least 8 carbon atoms. ost of the natural fatty acids have an even number of carbon atoms, because their biosynthesis involves acetyl-CoA, a coenzyme carrying a two-carbon-atom group. Unsaturated fatty acids have one or more alkenyl functional groups exist along the chain. The two next carbon atoms in the chain that are bound to either side of the double bond can occur in a cis or trans configuration. A cis configuration means that adjacent carbon atoms are on the same side of the double bond. The rigidity of the double bond freezes its conformation and, in the case of the cis isomer, causes the chain to bend and restricts the conformational freedom of the fatty acid. The more double bonds the chain has in the cis configuration, the less flexibility it has. 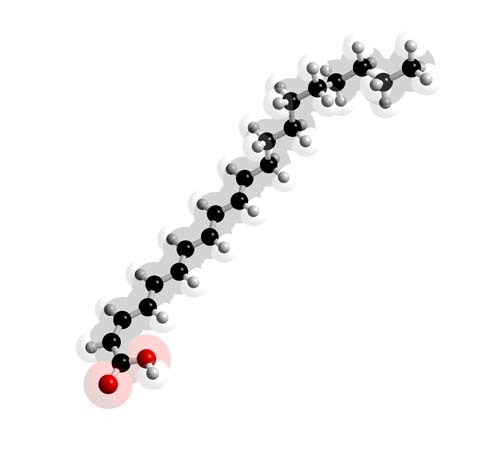 When a chain has many cis bonds, it becomes quite curved in its most accessible conformations. For example, oleic acid, with one double bond, has a "kink" in it, while linoleic acid, with two double bonds, has a more pronounced bend. Alpha-linolenic acid, with three double bonds, favors a hooked shape.The effect of this is that in restricted environments, such as when fatty acids are part of a phospholipid in a lipid bilayer, or triglycerides in lipid droplets, cis bonds limit the ability of fatty acids to be closely packed and therefore could affect the melting temperature of the membrane or of the fat. A trans configuration, by contrast, means that the next two carbon atoms are bound to opposite sides of the double bond. As a result, they don't cause the chain to bend much, and their shape is similar to straight saturated fatty acids. In most naturally occurring unsaturated fatty acids, each double bond has 3n carbon atoms after it, for some n, and all are cis bonds. Most fatty acids in the trans configuration (trans fats) are not found in nature and are the result of human processing (eg, hydrogenation). The differences in geometry between the various types of unsaturated fatty acids, as well as between saturated and unsaturated fatty acids, play an important role in biological processes, and in the construction of biological structures (such as cell membranes).